The Davenport Coffee Lounge is a School of International Service (SIS) institution. Its coffee fuels everyone from the early riser making the finishing touches on a paper to the professor prepping for classes, and it serves the aficionados who wouldn't know where else to get a decent cappuccino on campus. Affectionately known as "the Dav" across campus, this student-staffed coffee shop has a history nearly as old as SIS itself, but it's only the Dav's most recent incarnation that serves coffee, tea, and pastries. After American University (AU) first received funds from the Methodist Church needed to establish SIS in 1956, Ernest Griffith was selected to lead the school as its first dean. Griffith approached his mother-in-law, Edith Andrews Davenport, about bestowing the newly-conceived School with an endowment. Davenport agreed. As part of her funding, she requested that a chapel be built in the school in honor of her late husband, Frederick Davenport, himself a political science professor who was particularly devoted to his students of politics and international affairs. No stranger to AU, Frederick Davenport had delivered the 1943 commencement address to graduating students. The Davenport Memorial Chapel opened for its first service of 1959 on Wednesday, March 25. The Easter service, titled "The Meaning of the Resurrection," was led by the university chaplain, Edward Bauman, and ruminated on the questions of whether Jesus of Nazareth's resurrection was spiritual or physical. The chapel served the entire American University community, not just SIS students, until Kay Spiritual Life Center took over that role on campus in 1965. Over the course of its years as the Davenport Chapel, the space held regular Methodist services and Catholic masses, as well as occasional Episcopalian and Presbyterian services. After Kay opened, the Davenport Chapel was briefly used for storage before it was converted into the Davenport Memorial Lounge, a place for SIS students to study, read, and meet with peers and professors. The space also hosted student group meetings and academic lectures. Originally situated near the main entrance of what is now the East Quad Building, the Davenport Lounge housed a large world map, marble tables that once served as the chapel's altar, shelves stuffed with newspapers and magazines, and books "from Mao to Marx," as one Eagle writer put it. The Davenport Lounge served as a gathering place for students and professors alike. Then, in 1979 and 1980, SIS's international affairs students witnessed increased turbulence around the globe. The persistent threat of the Cold War, which served as the basis for SIS's founding, grew more menacing when the Soviet-Afghan War pitted the Afghan government and Soviet forces against rebels in Afghanistan in December 1979. Ultimately, the war displaced millions of Afghans and led to the US boycott of the 1980 Summer Olympics in Moscow. At the same time, the conclusion of the Iranian Revolution in February 1979 saw a change in leadership that was not supported by the US. That November, Iranian students took 66 people in the American embassy in Tehran hostage, holding 52 of them for more than a year. The world was changing, and students of international affairs wanted a place where they could discuss current events, engage in scholarly debates, and befriend other globally-minded students outside of their classes. As it turned out, the space already existed, and it only needed one addition to foster the kind of community SIS students needed: coffee. In 1980, both the undergraduate and graduate student councils sought the approval of then-Dean William Olson to start selling coffee in the lounge. The Davenport Coffee Lounge had arrived. An entirely student-run initiative, the Dav sold coffee and tea at cost and relied on student volunteers who staffed the Dav in two-hour intervals from 9 a.m.-10 p.m., Monday to Friday. If you wanted a cup, you poured it from the coffee pot yourself and dropped some change into a tin to pay. A cup of coffee or tea would set students back as little as $0.30. All money went directly back into keeping the operation stocked with coffee, tea, cream, sugar, cups, and filters. In an April 1985 Eagle article, a student journalist complimented "such tongue-tingling flavors of coffee as French Breakfast, Java & Mocha, and Colombian" served regularly at the Dav. Beyond just selling coffee, the Dav achieved its primary goal of bringing together the SIS community. That same Eagle writer commented, "I was struck by the variety of faces I saw and the multitude of languages I heard." Over time, the Dav became much more than a study lounge with a pot of coffee percolating. It evolved into a full-service, non-profit coffee lounge that employed work-study students. The Dav fell on rocky times in 2000, when the university was considering replacing the student-run lounge. The university requested a major change to operations that temporarily sidelined the Dav: the coffee lounge would have to become a licensed coffee shop. The demand meant that the Davenport would have to operate as a business and pay full salaries to employees, who were federal work-study students with subsidized pay. During this period of uncertainty, the Dav couldn't make any sales; instead, self-serve coffee was available for free. In October 2000, AU President Benjamin Ladner decided to allow the Dav to pursue a non-profit organization license and open its doors once again. In 2010, the Dav migrated to its current location in the new SIS building. "Business took off when we moved to the new space," said manager Becky Regan. Entirely self-sustaining, the Dav doesn't receive any money from the university or SIS and uses all profits to purchase products and pay the work-study students behind the counter. So how much do students, staff, faculty, and visitors enjoy their drinks from the Dav? The Dav goes through about 300 pounds of locally roasted coffee per week. In 2017, the Dav served more than 27,000 cups of coffee; 33,000 fresh pastries from local vendors; 18,000 chais; 15,200 iced coffees; and 12,200 lattes. "The mission of Davenport is to have a space on campus for faculty, students, and staff to come together," said Regan. "We feel lucky to be part of the SIS community, which has always been so supportive of the Dav." 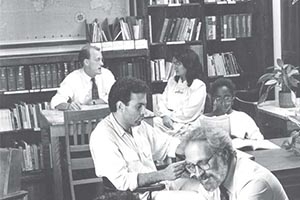 Learn more about the 60th anniversary of the School of International Service.